had just settled our brains for a long winter‘s nap…. This poem is a perfect example of anapest, which runs throughout the poem. Most of the lines are following anapestic tetrameter. Like in the first line, there are four anapests. However, three anapests are also used in other lines. It helps create artistic lines with a regular meter in a poem. 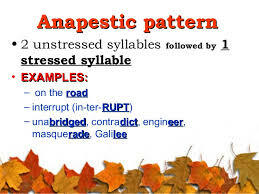 Since anapest ends in a stressed syllable, it makes strong rhyming lines that create music in a poem. It plays a very important role in poetry and the most common role in verses is that of a comic meter, which is, the foot used in the limerick for comical effects.